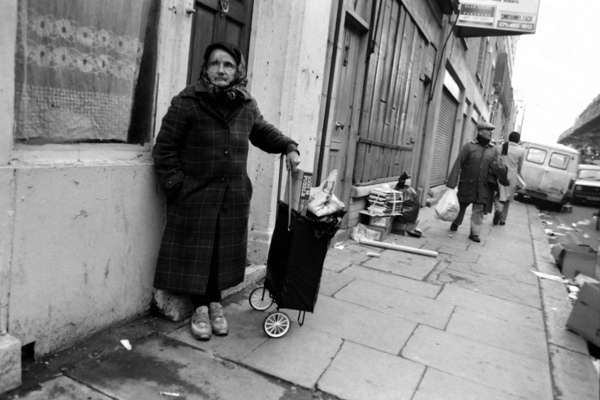 When I wrote the story of Blackie, the last Spitalfields Market cat, my friend Phil Maxwell sent me his photographs, taken twenty years ago, of the cat lady of Spitalfields who used to feed all the neighbourhood felines daily. It is my great pleasure to publish these pictures today with Phil’s accompanying text as a means to introduce you to his blog – Playground of an East End Photographer – that he started just last week to publish the entire canon of his life’s work online, at the rate of a few photographs every day. 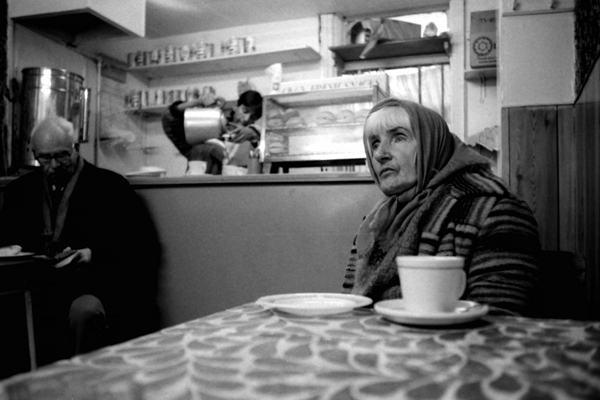 For over thirty years, Phil has been recording the people and the changing life on the streets in Spitalfields, and so for anyone interested in the East End www.philmaxwell.org is an essential daily port of call. Phil & I are eager to learn more of the mysterious cat lady who disappeared twenty years ago, so please get in touch if you know her name or can supply us with further information. 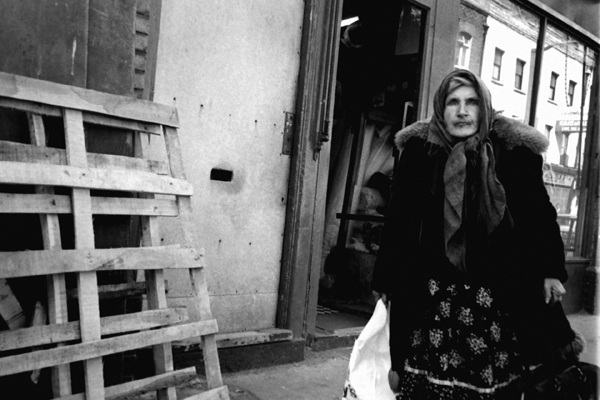 The cat lady on Brick Lane in the late nineteen eighties. 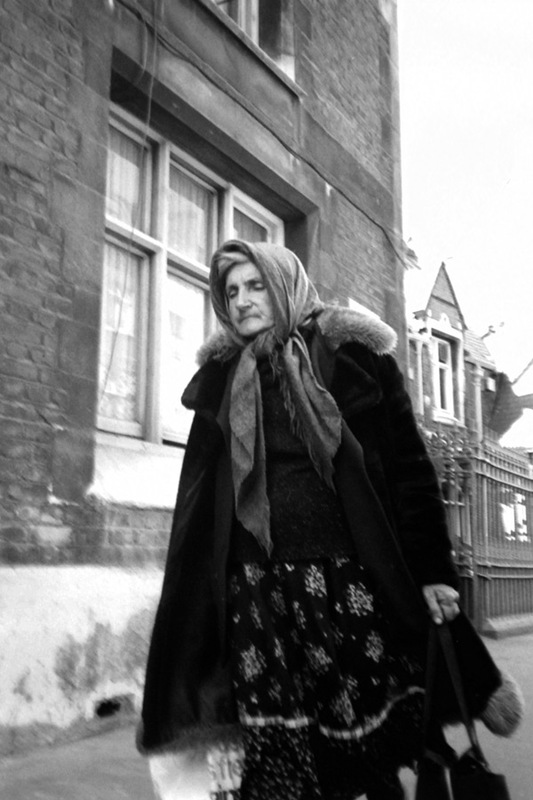 The woman in this photograph was always dressed in a head scarf and large coat. Usually she would pull a shopping bag on wheels behind her. She was the cat lady of Spitalfields. She knew where every cat and kitten lived in the wild and made it her task to feed them every day. Her bag was full of cat food which she would serve on newspaper at designated spots around Spitalfields. The cat lady pauses for a second beside the Seven Stars pub on Brick Lane. She has just left some food in the ‘private road’ for some cats. The cat lady floats past Christchurch School on Brick Lane. With her eyes closed she contemplates the next cat awaiting a delivery. The cat lady waits outside her favourite cafe in Cheshire Street. Now a trendy boutique, in the nineteen eighties you could buy a cup of tea and a sandwich for less than a pound at this establishment. The cat lady ‘kept herself to herself’ and avoided the company of others. It must be about twenty years since I last saw the cat lady of Spitalfields. She devoted her life to feeding the stray cats of the area. I have no idea where she lived and I never saw her talking to another person. She seemed to live in her own separate cat world. Even though I was sitting opposite her when I took this photograph, I felt that she had created a barrier and would be reluctant to engage in conversation. It was impossible to make eye contact. 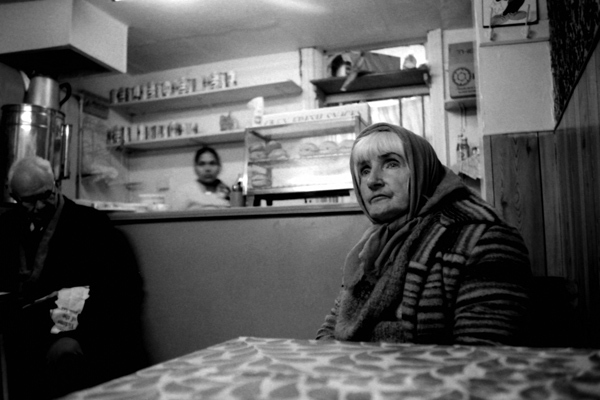 I’m pleased I photographed her on the streets and in her Cheshire Street cafe. 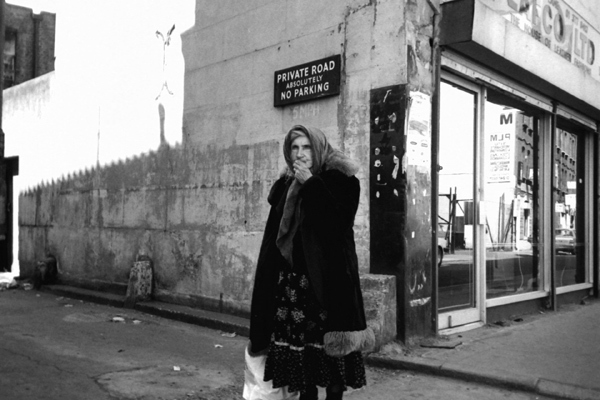 She would not recognise Cheshire Street and Brick Lane today. I wonder if the Gentle Author knew or has photos of the Beigal Lady of yester-year ? Love it! Phil Maxwell is a Legend! I love her skirt, scarf and fur trimmed coat! I am becoming obsessed with your blog, this really took me back! I remember the Cat lady well, my sister and I used to chat to her regularly, she was quite willing to chat although usually it was mostly about cats, of course. I believe her first name was Mary and I think she came from Yorkshire but I will check with my family to see what else anyone can remember about her. She loved cats and she must have spent a lot of money buying food to feed them, there were so many feral cats in those days as there were so many empty houses – not like now! I remember the Cat lady as I now know her nickname…I always wondered what she had in her bags…great photo’s!!! A wonderful story and photos! I’ve shared this with some other fellow cat ladies. I wish there were more like her out there. Boy the photos brought back som great memories.me and my family lived and grew up at no7 henage street . Memories of a life and time that was. She had been beautiful in her life. Time moves on for all of us, nothing stays the same. It would be nice to know what happened to her. I’d love to know more about this lady. Fascinating. What a lovely kind person.